Greetings cards addressed to Miss Stone [May Stone], George Street, Altrincham, Cheshire, England. 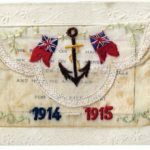 Some are embroidered and colourful with patriotic scenes of flags, anchors etc. 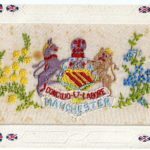 These include: a 1914-1915 card (inscription "Souvenir from behind the firing lines", from W. Abrahams thanking her for "the sleeping cap", card printed in Paris); Best Wishes card (inscription Xmas 1915, signed "Will"); Manchester Regiment badge (inscription "Somewhere in France June 9th 1916", signed "Will"); A Happy Birthday (inscription "Dearest May, France 1916", signed "Will", her birthday was April 23); Xmas Greetings 7th Division (battle honours Ypres, Neuve Chapelle, Festubert, Loos) men marching with greatcoats, caps, sacks and belongings as well as rifles etc. (inscription Xmas 1915, signed "Will"); 25 Division Christmas 1918 (inscription "20th Manchester Regt BEF", "Near Cambrai", "Reg B 31/12/1918" "Cheers Billie! See you soon" "Congrats on getting home OK"). This is part of a collection that relates to William Hunt. Hunt signed on in 1915 at Manchester Town Hall to the 5th City Battalion, Manchester Regiment. His initial training was at Bellvue, Manchester then Morcambe and finally Grantham, before going to France in December 1915. He fought at Albert and Fricourt and after a spell behind the lines with trench fever was sent back to the front to join the 8th Loyal North Lancashire Regiment at Thiepval where he was injured by mortar fire, wounded through the thigh and taken prisoner on 26th August 1916. He then spent the rest of the war in two or three prisoner of war camps before being repatriated at the end of the war and demobilised at Preston on 19th March 1919. In his attestation certificate, downloaded from the Ancestry website, Hunt's details include: No. 1712 [? ]; Corps: 5th City [?] Batt. Mtsr [Manchester?] Regt; Your name: William Hunt: Address: Rosslyn, Hazelwood Rd, Hale [? ], Cheshire; Age: 24 years 10 months; Trade: clerk; Married: no; Previous service: no; Witness to Hunt's signature: K. Howell. Two CDs of his story have been recorded telling the details of his wartime experiences from signing on to repatriation. These are marked "20 SB Manchester Res. L/C William Hunt, No. 17127. WW1 memories". A number of photographs of the period are also in the collection and postcards to his fiance, May Stone.